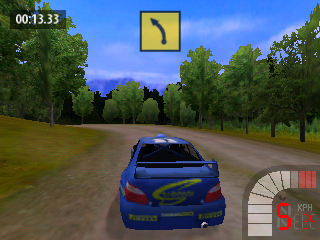 Richard Burns Rally is a racing game that was originally released on the PlayStation 2, Xbox and Windows PC in 2004. It consists of 10 stages and 8 officially licensed rally cars, and the modes on offer are Quick Rally (single races) and Arcade (4-10 stage marathon). In the latter mode, all applicable stages must be completed consecutively, as failing to reach a checkpoint before time expires will result in a Game Over. The controls are sensitive and it can take a while to adjust to how touchy they are on straights, and how to carefully balance your vehicle while cornering. It's a fine line, but once you get the hang of it the game becomes a thrilling white-knuckle ride! The environments are varied and interesting, as while Stage 2 has narrow, barrier-less pits that lead directly into the water, Stage 4 features heavy snow where keeping visibility of the actual road is a struggle! I also like how they transition throughout stages, as one minute you'll be dodging ice boulders, then climbing a winding mountain. Content is missing from the original versions (namely the Rally Season and the ability to repair your vehicle after each stage), but the streamlined approach works well and better supports the dip-in, dip-out nature of a handheld game. You're given very little time to reach each checkpoint, which some could see as a way to artificially inflate the game's short length. However, it's not too overbearing and the racing is so intense and engaging that you'll want to keep trying. The frame-rate can be sketchy at times, but the graphics are some of the finest on the Gizmondo, and your co-driver and the on-screen icons do a great job of letting you know what's ahead. The SFX shine too with terrific stereo separation based on your car's positioning to the surrounding environment. There's no denying that Richard Burns Rally is a drastically cut-down version of the console and PC original, but the exceptional racing will keep you coming back for more. It's perfectly suited to the handheld format and is complimented by top-notch course design and all-round fantastic presentation. Random trivia: Gizmondo Europe Ltd also published Trailblazer on the Gizmondo in 2005.